Today we had an amazing animal day despite our really crappy day of trying to get to our points to collect data. We ended up waist deep in thick floton (floating plant matter) in some areas and it was not pleasant. Sometime floton is thick enough to actually walk on, carefully, but this kind was not too thick and breaking through it was inevitable. That means you then post-hole through the floton moving at an incredibly slow pace. It was not pretty. 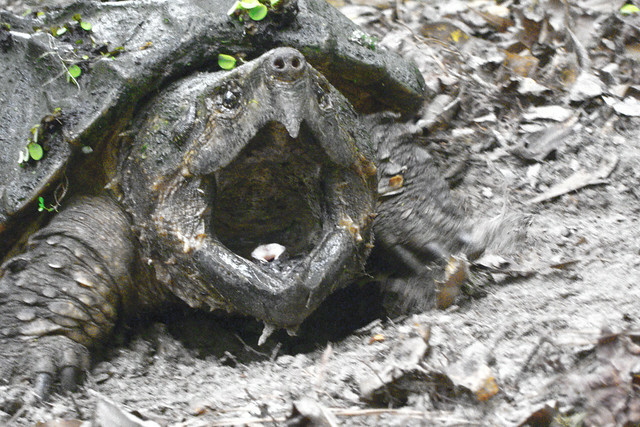 However, we were able to get some awesome shots of animals today, including this alligator snapping turtle up on shore to lay eggs. 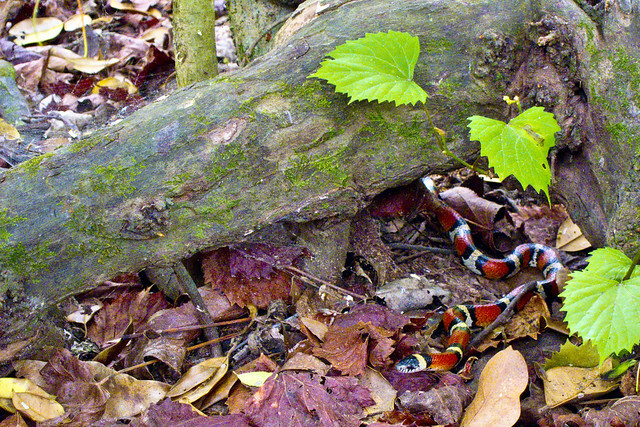 And then we ran into this snake. Chris did a quick “red on yellow” check and we determined we were in the safe zone. We thought this was a scarlet king snake but I did some quick looking and I think it is actually a Louisiana milk snake, Lampropeltis triangulum amaura. SKS’s have a red head and these do not. 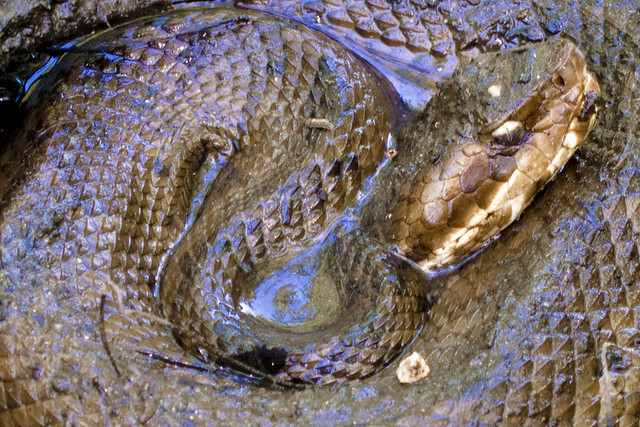 We saw four of these today, cottonmouths. Blech. I hate them because they really sneak up on you—or rather you sneak up on them. 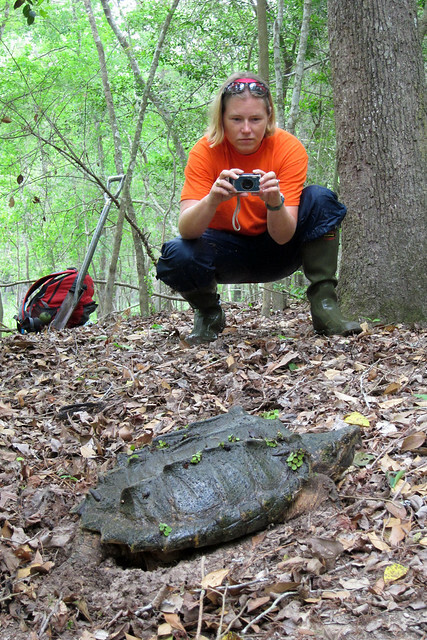 They’ll be idly sitting on a log or vegetation and *bam* you see it. Yesterday we had a long transect through dry/moist woods (dry but with wet areas) and Chris had walked past these plants and as I was behind him I ended up spotting it. 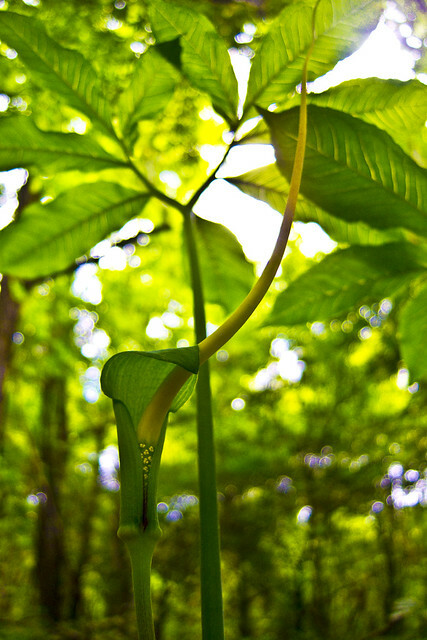 We figured it was some Jack-in-the-pulpit relative and later found it was called Arisaema dracontium, the green dragon. Pretty cool find! At the boat ramp we often go out of there are a lot of birds in the area. A group of black belly whistling ducks ended up perching on a cypress tree back in the marsh. Several of our coworkers got out their spotting scopes and Chris shot this photo through that. Pretty cool! 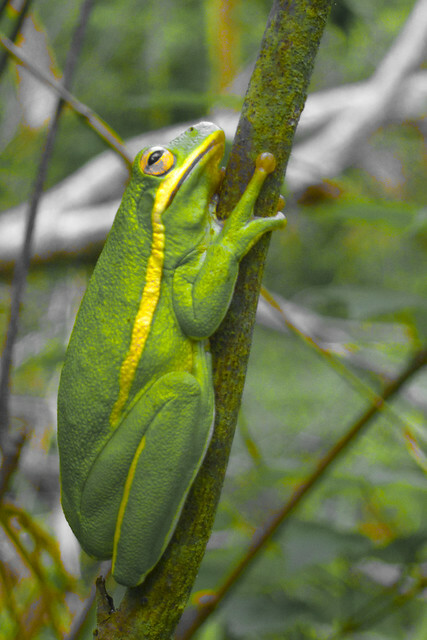 And then of course the fun green tree frogs! Love having them jump on me and perch for a few seconds before hopping off into the cut grass. 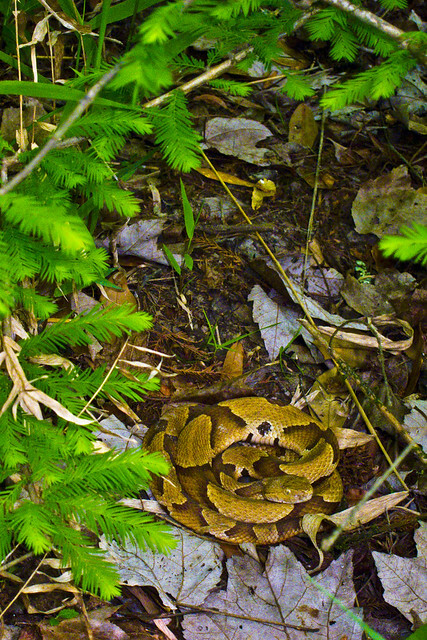 Here’s another shot of the copperhead that was under my legs the other day. Much better spot for it than underneath me! 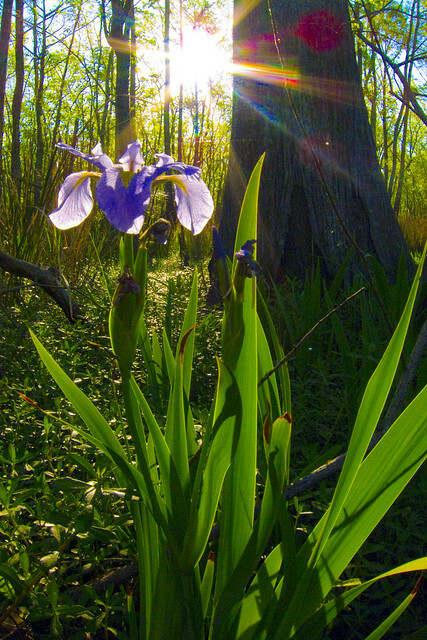 The Virginia iris are almost beyond their peak but a few are lingering. 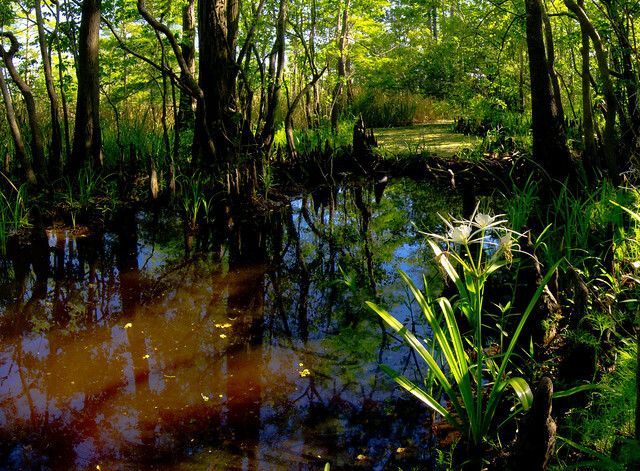 A few areas look a lot like Big Cypress with their spider lilies. You can thank Chris for all the photos! We saw several other animals today, an owl, box turtle, a great white egret rookery, two banded water snakes, two garter snakes and leeches. They really enjoyed my knee and left a nice bleeder for about twenty minutes. I found teeny, tiny ones, too and those were even worse to try to get off. I could do without leeches for the rest of the time out here. Looks like we’ll be getting at least a week off between projects as the main biologists will be going back to the office while we contract workers go home for awhile as they plan the next segment out. Then we’ll be back out for six to eight weeks—right when it starts getting hot and the mosquitoes decide to carry us away. Great photos Chris! Thank you for the education Misti! With all the trudging through muck you guys do on a daily basis, it’s no wonder you were so prepared for the AT!